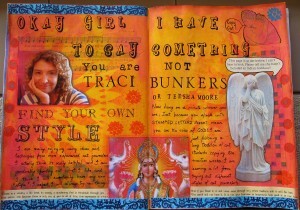 I’m enrolled in the 21 secrets online art journaling course and one of the teachers is Traci Bunkers. I like her work and I own a copy of her book “The Art Journal Workshop”, which is a useful book for someone new to art journaling as she gives step by step instructions and photos of exactly how she produces her pages. Not surprisingly, when people are following her instructions in 21 Secrets they end up producing pages which are quite similar to hers (the same is true for most of the other teachers also). 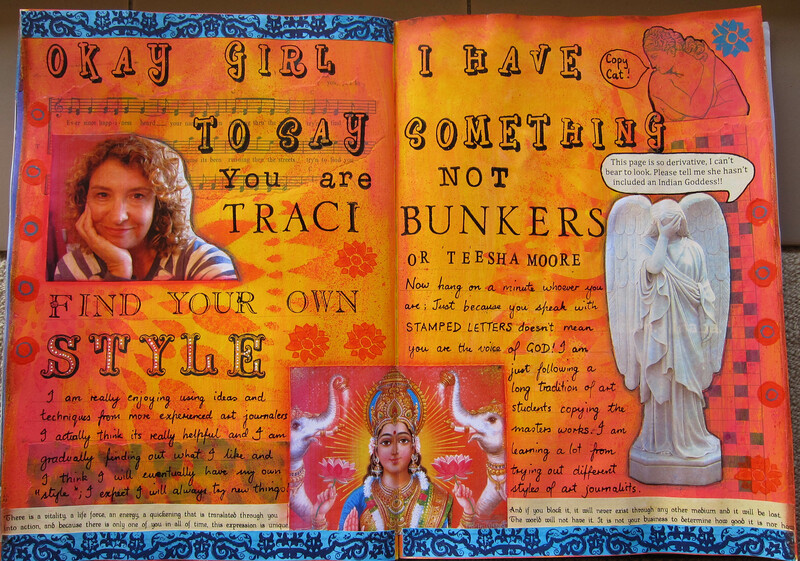 Anyway, I admire Traci and am not meaning to make fun of her at all, only of myself, as she is not the only art journaler I have tried to copy (see my Teesha Moore inspired page here) However, once I had addressed myself sternly in stamped letters I began to argue with myself, because actually I think it’s fine to be copying the style of others when you are starting out in something, as I say on this page, I’m just following the ancient tradition of art students copying the masters in order to learn new skills. What do you think?